Being physically active has been an important part of Sam’s entire life. He has been involved in competitive martial arts for years competing across North America. He left martial arts to play volleyball for several years and eventually ended up on the Canada Junior Mens AA and then Senior Mens AA championship teams. Lifting weights had been introduced to him at a young age as well. It wasn’t until a few years after high school that he decided to turn his passion for being active to a profession by helping people attain their fitness goals. 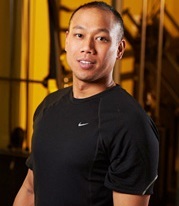 He is a CFT (certified fitness trainer) through International Sport Science Association, and is currently enrolled at the University of Manitoba – working towards kinesiology and physical education degree.